The entry to Historic Kailua Village begins on Alii Drive where its oceanfront promenade offers sweeping vistas of Kailua Bay, from Kamakahonu and Kailua Pier to Hulihee Palace. This expanse holds significant archaeology, legendary treasures and historical sites. After uniting the Hawaiian kingdom, King Kamehameha the Great returned from Oahu to Historic Kailua Village in 1812 to rule from his compound at Kamakahonu. This was the center of political power and his top advisors gathered at Ahuena Heiau nightly. Many descriptions and illustrations of the impressive Ahunea Heiau, the religious temple that served Kamehameha, were done by early voyagers. King Kamehameha died here in 1819. Ahuena was rebuilt in the 1970s as an accurate 2/3 scale model replica and continues to be restored and maintained today. Click here to learn more. 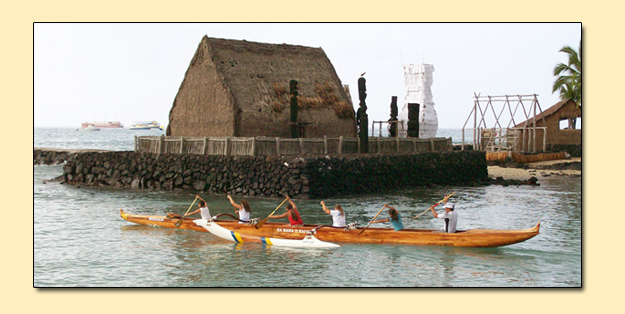 The first Christian missionaries arrived from New England in 1820 and were granted permission to come ashore at a location now covered by the Kailua Pier. Hawaii’s first Christian church is Mokuaikaua and it was founded by Boston missionaries in 1820. A model of the Brig Thaddeus that carried these first missionaries is on display at Mokuaikaua. Preceded by two thatched hale, the church was transformed from 1835 to 1837 with exterior walls of lava rock masonry and crushed coral mortar. Constructed in 1838, Hulihee Palace served as the gracious residence of Governor John Adams Kuakini and was a favorite retreat for Hawaii’s royal families. It is one of only three palaces in the United States. Today, the Palace is open to the public and is operated as a museum by the Daughters of Hawaii. Kailua Pier has anchored Historic Kailua Village since the early 1900s. Once the center of transportation and shipping where paniolo (Hawaiian cowboys) loaded cattle, Kailua Pier now serves as a gathering place for fishing and ocean recreation enthusiasts. The Hawaiian International Billfish Tournament has held its annual event here since 1959. Signage marks the start and finish line of the Ironman Triathlon World Championship where every October over 1,700 athletes electrify the crowds of spectators.